Gardner-Webb University, a coeducational institution associated with the Baptist State Convention of North Carolina, is located near Shelby in Cleveland County. The youngest of North Carolina's Baptist colleges, Gardner-Webb traces its origins to Boiling Springs High School, founded in 1905. Distinguished alumni of Boiling Springs included Wilbur J. Cash, author of The Mind of the South, and Dewey Whitaker, president of Lehigh University. The 1920s witnessed the expansion of public high schools in North Carolina, leading to declining enrollments at sectarian institutions such as Boiling Springs. In response, Boiling Springs High School, along with its sister institutions at Mars Hill and Buies Creek, reorganized as a junior college. 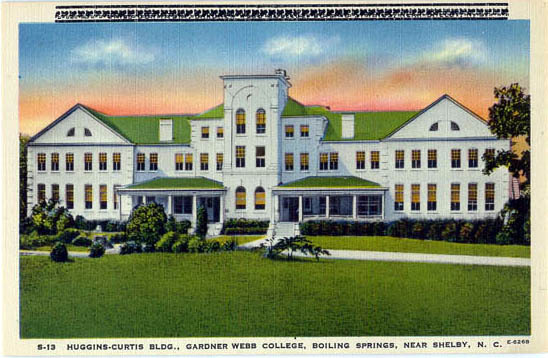 The generosity of former North Carolina governor Max Gardner and his wife Faye Webb Gardner led Boiling Springs to change its name to Gardner-Webb Junior College in 1942. In 1947 the North Carolina Baptist Convention began supporting Gardner-Webb. In 1969 the junior college became Gardner-Webb College, and the first four-year class graduated in 1971. Gardner-Webb's first graduate program, in education, was initiated in 1981. In the 1980s Gardner-Webb also initiated an international study abroad program with Japan's Dohto University. To the college's graduate education program were added a master of business administration curriculum and a divinity school. In 1993 Gardner-Webb College became Gardner-Webb University. By the early 2000s Gardner-Webb had more than 3,200 students taught by approximately 135 faculty members. The university offers dual degree programs in engineering with Auburn University and the University of North Carolina at Charlotte. It inaugurated its first doctoral program, a Doctor of Ministry, in 2001. Francis B. Dedmond, Lengthening Shadows: A History of Gardner-Webb College, 1907-1956 (1957). Lansford Jolley, Dreaming, Daring, Doing: A History of Gardner-Webb University, 1907-1997 (1997). Huggins-Curtis Building at Gardner-Webb. Image courtesy of NC Office of Archives & History. Available from http://www.ncmarkers.com/Markers.aspx?sp=Markers&k=Markers&sv=O-43 (accessed November 16, 2012).